These woodblock prints were efforts done over the last 14 years as I moved into what was a new realm of art for me. 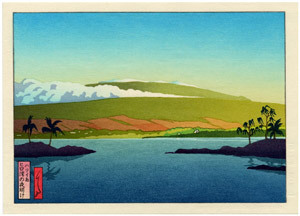 After discovering the Japanese artists Hiroshige and Hasui in Hawaii in the late 70’s it later occurred to me to meld my interest in Hawaiian scenes with the art of woodblock prints as these Japanese artists had done with their homeland. Hawaii seemed rich in all the elements that I thought would make a good print. These being early and sporadic efforts, their quality as contributed by the carver and printer I employed to make them outshines my sketchy design efforts. Ironically I had turned to the computer to improve my designs with the idea of them ultimately becoming woodblock prints, but coming to appreciate the qualities digital prints offered me in the way of immediacy, control and their greater economy has derailed me largely from that endeavor over to making digital prints. So whether I will again make woodblock prints is up in the air, these are history and it is very unlikely anymore will be made from those blocks. Still, woodblock prints have their own magic qualities, so I never say never that I may not yet be tempted to make woodblock prints with new designs. Morning Light at Hilo Bay – NEW!